If you're new to sewalongs, you might be wondering what exactly a sewalong is. Basically, it's like sewing with friends, all doing the same project, except you're sewing at home and checking in online. What makes it fun is when everyone shares their progress and of course, the finished projects. Oh, and I can't forget to mention the awesome prizes! Look for details on how to enter for prizes at the bottom of this post. I taped a couple template sheets together to get my piece long enough, and they'll fold where I taped for easy storage. I used a permanent marker to copy the placement marks and the cutting instrcutions right on my templates. The other advantage to the clear templates, is that it helps to visualize pattern placement for fussy cutting. For the supplies, I've used quilting cotton, shapeflex 101, and Pellon Flex Foam for the foam interfacing. If you want to learn more about selecting interfacing, I suggest taking Sara Lawson's Craftsy class, you can learn more about it in my review of the class. If you have a really special fabric you want to display, you'll really only need enough for the front pocket piece, and then the rest of the exterior could coordinate with it. I often write myself a list of what to cut from each material, but the book already has it laid out in that format, so I just followed along straight from the book. Once you're done, go through the list one last time to make sure you've got everything. For cutting, I like to start with my interfacing. For this bag, the lining is all interfaced with shapeflex, so I cut my interfacing first, then fused it to my lining fabric, and then cut out my lining fabric - this helps save a bit of time by not having to trace the pattern onto my lining fabric. Make sure to cut on the fold. Some other people save cutting time by simply interfacing the entire yardage of the lining fabric, and then tracing and cutting both together; this option does save time, but it isn't a very frugal method. You can also use the interfaced lining fabric as your pattern piece for when you cut the foam - this way you don't have to fold the foam in half and it allows for more accurate cuts. For my exterior fabric, I used my clear templates, and this helped me visualize the design of my exterior fabric so I could have it just where I wanted. When I cut the handle extenders, I used the method suggested in the book, and folded the interfacing so I could cut and trace a mirror image set at once. I just pinned the folded interfacing, then traced and cut. I cut the interfacing, and fused it to my accent fabric, just like I did with my lining fabric, to skip the step of tracing the handle extender pieces onto the accent fabric. If you like, you can secure the foam interfacing to the exterior fabric at this point. I find the Flex Foam, similar to the Soft and Stable, has a nap to it, so the fabric stays in place quite well. To secure the foam to the fabric, simply sew a basting stitch with 1/8" seam allowance along all the edges. If you used fusible fleece, then you'll want to fuse at this point instead of the basting stitch. I highly recommend following the book's suggestion and cutting the pocket trim on the bias, instead of a straight grain cut. It's a small piece, so won't "waste" a lot of fabric cutting on the bias. We'll be using this piece on a curve, so the bias cut will allow us to place the trim along the curve nicely. Once everything is cut and fused/basted, place it in a pretty pile and gather your matching hardware, thread, and zippers, and come back here for Day 2 of the sewalong to get started with pockets and handles. My awesome sponsor, Sitka Fabrics, is offering up a $10 gift certificate and a $25 gift certificate. Aurifil has also sent me some thread sets for prizes. There will be one "top prize" of one thread set and a $25 Sitka Fabrics gift certificate, and 3 random prize winners to receive the remaining 3 prizes: one winner of the $10 Sitka Fabrics credit, and two winners who will each receive an Aurifil thread set. If you follow me on Instagram or Facebook, you're probably aware that I recently took the Mix & Match Clutch Bag Techniques Craftsy class taught by Janelle MacKay. Today I'm sharing my review with you. I also have a discount to pass along (details at the bottom of this post). I really enjoyed the fabric lessons Janelle gave; she talked about some fabric that is typically considered more difficult to work with, and she provided tips on how to use them in these bags. The first time I watched the class, I pretty much had my mouth gaping open in awe the whole time. The entire class wowed me. I really could not wait to get started making the clutches and trying out the new techniques I had learned. The first clutch I made from the class, and also the first turn lock I installed all by myself, using tips from the class. I used the asymmetrical flap and the trapezoid body front. I really love the concept of these mix and match patterns. The class includes pattern pieces and instructions to make a virtually unlimited number of combinations for your clutch. You can choose from 3 different flap fronts: asymmetrical, pointed and rounded. You can also choose the body front: trapezoid, rectangular and pieced. In addition to those options, Janelle teaches how to make your own shape if you choose. The hardware options add even further to the uniqueness of your bag. There are also several strap options for you to choose from, including wrist strap, shoulder strap, and metal chain. The construction of the clutches are identical, no matter which shape you choose. The lining of the clutch eliminates the need for a wallet with the bag. There are 3 card slots, a "lipstick" slot, a zippered pocket and a slip pocket. I really have been enjoying Craftsy lately! This is the first time I've made a project along with a video, and it really felt like I was sewing along with the instructor. I liked being able to pause and back up, refer to my class materials, and even read questions from other participants. Craftsy really offers a lot of flexibility to access your classes. You can watch from the computer, or from a tablet or smart phone. There's even a Craftsy app, which is my preferred way to access my classes. The app makes it easy to switch quickly between video and class materials. If you like, you can download individual lessons, so you can watch them offline as well. Craftsy is risk free too; if you don't like the class, you can take advantage of their money back guarantee. Janelle MacKay designs patterns and hardware at Emmaline Bags. Her sense of humour is so endearing and really adds to the enjoyment of the class. As I mentioned before, these Craftsy classes really make it seem like you're spending the day sewing with the instructor, so it's important that the instructor is someone you'd want to spend the day sewing with! I found she had a relaxed demeanor that made it easy to learn from. The techniques she showed have already improved my bag making and I'm so grateful for the knowledge she shares with us in the class. I think this class is suitable for advanced beginners and up. Even very experienced bag makers would benefit from this class, if not just for the patterns it includes. I learned extra finishing touches, how to properly install a turn lock, how to add metal trims, how to get perfectly folded card slots, and so much more. I imagine I'll be referring back to this class many times when I want refreshers for certain skills or techniques. When I made my second clutch, I enjoyed being able to skip to the parts I needed to refresh my memory on those steps. The second clutch I made from the class; this time using the pointed flap and rectangular front, with gold trim. Enjoy 50% off with this discount link, good through March 4, 2016. Update: that discount is over, but check the link anyway, there are often sales and it may be on sale again! Full disclosure: I bought this class for my own use and I'm now sharing my review with you. 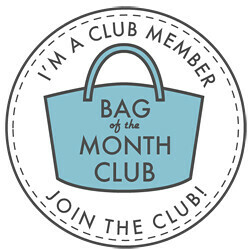 Because I'm a Craftsy affiliate, I was able to obtain a discount to share with my readers. This post contains affiliate links and I earn commission from sales made through these links. All opinions expressed here are my own. Thanks for your support! If you've taken the class, I'd love to know what you thought. Or is it on your wishlist? Take advantage of the sale price and get making those clutches! In addition to the interior zippered pocket, the bag has a front slip pocket with pretty dart tucks, secured by the flap. The flap is closed by a unique bottom tab with magnetic snap. I chose black vinyl for the gusset and tab and I think it completes the timeless look. This was one of the faster Swoon bags I've made and I would say it's suitable for a confident beginner. Harriet is expandable! Each side opens wider with zippers. It's also part of the Swoon Vintage Collection. This bag was definitely more involved than Sandra, but certainly worth the effort. I used a couple prints from Bonnie Christine's line Winged (Dragonfly Fabric) and some matching vinyl. I also chose O rings (Emmaline Bags) instead of the suggested rectangle rings, mostly because I had them in the right finish; I think either shape works just fine. The main top opening is secured by a flap tab with magnetic snap. There is also an interior zippered pocket, and room to add another pocket if you like. The vinyl overlays and straps gave me a bit of trouble until I remembered to use my walking foot - why do I always forget?! Overall, I love the style of this practical tote. I think this pattern is suitable for an intermediate bag maker. 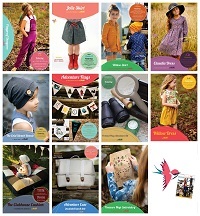 The Swoon Sewing Patterns Vintage Collection offers really great value, even for Canadians with our not-so-great exchange at the moment. The per pattern price is really affordable, and I love having a variety of patterns to choose from in my pattern library. The collection concluded with Maisie Bowler Handbag, an adorable pattern that I'm itching to sew up. I'm not sure how long the collection will be available for purchase, but once you purchase the collection, all 12 patterns will be in your account for good. 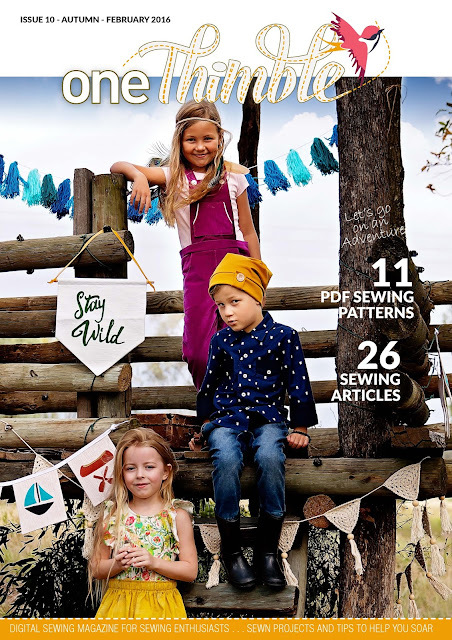 One thing I really like about Swoon Sewing Patterns, is that you can always access and download your purchased patterns, for an unlimited amount of times. You can also take note if any revisions have been made on a pattern before you tackle a new project. Have you made a bag from the Vintage Collection? Which one is your favourite? Once again, I'm thrilled to join Pattern Revolution's One Thimble Blog Tour! 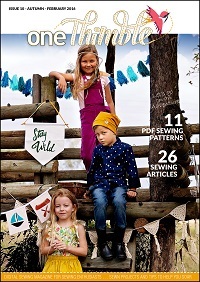 This time, I'm sharing my experience with the Swoodson Says pattern, Adventure Flags. One Thimble is a digital sewing magazine, or ezine, and the issues contain PDF patterns, tutorials, sewing articles, tips, and lots of great content. You can see my previous posts about One Thimble here, here, and here. Issue 10 is looking to be the best one yet. I'm blown away by all the amazing contributors and patterns it has. I'm also excited to announce that I am a contributor in this issue as well! I'll include more details about that in a bit. 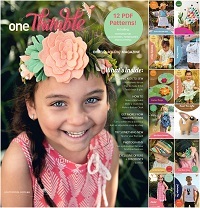 You can enter to win a copy of One Thimble Issue 10 at the bottom of this post. It is available as a stand alone pattern, or included in ﻿Issue 10 of One Thimble﻿. As soon as I saw this pattern, I knew immediately that my kids would love it. I was right, and they were more involved with this project than most others. They helped pick fabrics, felt colours, and, most importantly, placement of the flags in the buntings. We all thought they would make perfect decor for birthday parties! The appliques are all cut out of felt and I used freezer paper as the pattern suggests. This was my first time using freezer paper and I found it so easy and helpful to cut those intricate shapes out. I couldn't imagine tracing them all individually onto the felt and then cutting out. I really enjoyed the mix of fabrics and textures used for this project. I used felt and quilting cotton as the pattern suggests, but I also used a natural canvas muslin for the back of each flag, which really gave them a good weight and body. I think the natural canvas would have worked for the front as well. This was a very different project for me, and I'm enjoying continuing with my theme of trying new things this year. I cheated a bit with the compass applique and just used fabric paint instead for the letters. I think it looks just as nice. The pattern was very easy to follow and I think this would be a suitable project for even the greenest of beginners. As for my contribution, I created a tutorial for this reverse applique pillow. I call it Hello With Love. I envisioned it to be a treasured gift for grandparents, but I'll have to make at least another one, because I love this one too much to part with. I show how to turn kids' hand-prints into lasting mementos. I hope you enjoy the tutorial as much I did creating it. Hop along on the tour and enter to win!